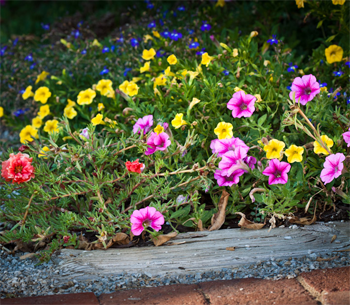 The flowers that are produced from annuals, perennials, shrubs and trees can enhance any garden. Most people design their garden without thought of using all of your senses. Your sense of sight, smell, hearing, touch and even taste can make your garden a wonder place! Imagine if you had lost your sense of sight. Many would say, if that happened, a garden is not practical, but brushing against a soft hemlock, listening to rustling leaves of an Aspen, smelling a Lilac and even tasting some herbs will be make a much more meaningful experience to anyone’s garden. The Internet has made planning any project much easier, but it is still a large task. The range of information is unlimited to fit every need. Science has also made choosing plants with many improvements, longer blooms, new colors, tolerance to shade, resistant to deer, and stronger stems are just a few. Mother Nature has a hand in flowers that are full of color and fragrance. The colorful and fragrant flowers are signals. These signals lure the pollinator to the stamens and pistils so that they can be fertilized. The flower is advertising the presence of nectar. Most insects are very sensitive to colors and have and have preferences to specific shades of color. Honeybees can be trained to color signals. Many insects have been tested and their vision of flowers is different than what humans are. The insects are very sensitive to ultraviolet, a color we can’t see. Pollination is not only done by insects. In American red flowers are pollinated by humming birds. Beetles have poor vision so pollination always has large flowers which are usually white and very fragrant so that they are easy to find. Flowers that are pollinated by moths also have light colors and strong scents so that they can be found in the dark. 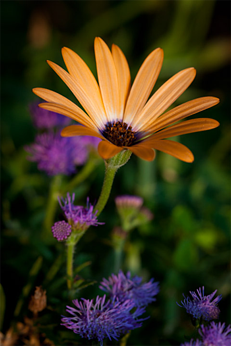 Sometime the colors are used to indicate whether the flower has been pollinated yet. In some plants the flower changes color after it has been pollenated to make it invisible to bees as a signal the nectar is finished. The function of colors that are on certain seeds and fruits tell that they are ripe and also to attract animals which will propagate them. Planning your garden can be a great learning adventure! There are plenty of things to plan for. One of the first things you do is make a quick list. The list will help you eliminate many unneeded choices that will not work in your area. What colors will I use? What plants will work in the amount of light? What plants will work in that soil conditions? What senses will we use? Do we have enough evergreen? Do we have size variation? Do we use rocks and what kind? Do we use garden ornaments or structures? When do the flowers bloom and how long? Water features are great for sound. What kind of eatables if any? 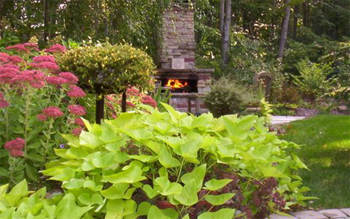 Creating a top notch garden is a huge task but can be rewarding for many years to come!